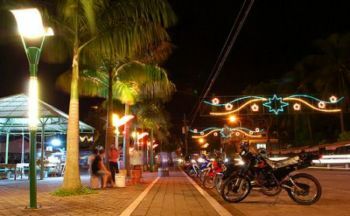 , now known as the Palm Tree City of the Philippines, is one of the fastest growing cities in Mindanao. It is the home of the WORLD'S BIGGEST ROSARY, made out of ironwood, located at the Christ the King Cathedral, also, the biggest church in the region. It is also known as the music capital of Mindanao for its Musikahan Festival which is celebrated around the last week of the month of February. One of the more attractive events that gather people from neighboring cities like Davao and Panabo is the 30-minute fireworks display (it is illegal to light fireworks in most cities in the Davao Province due to casualties that arises during the season) during New Year's eve celebration.